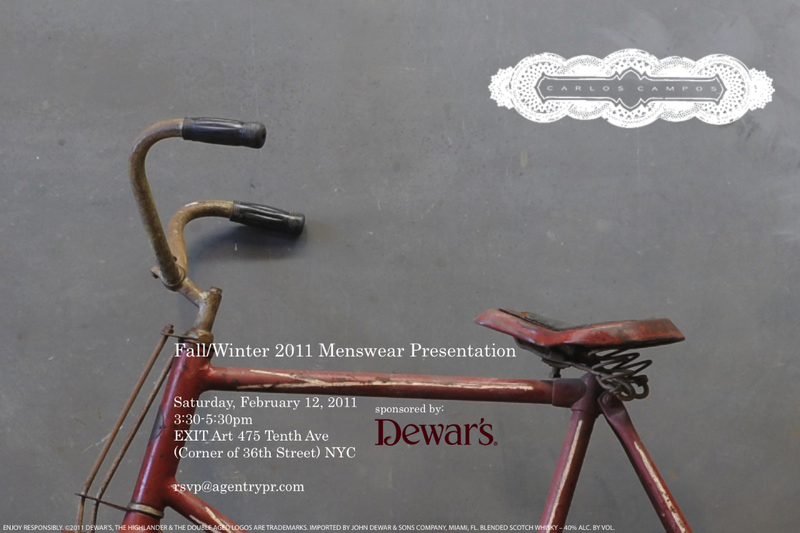 I’m proud to announce my involvement in New York [by way of Honduras] designer, Carlos Campos’ latest menswear collection. Above find the invite I designed for the presentation and below read my description of the new collection… and stai toon’d for a separate behind-the-scenes post. Fall is a season for change, for reflection, for realization. A season that enabled Carlos Campos’ introspective return to his Latin roots. Traveling back in time and across continents, Campos found inspiration in South America’s most beloved poet; the romantic, Mr. Pablo Neruda. From the tip of his newsboy cap and tap of his cigar, Neruda’s stylistic mark is revitalized through Campos’ signature synthesis of old-world craftsmanship and modern male sensibilities. Using the highest quality Italian wool and pima cotton, Campos’ details come alive in relaxed fits cued by Neruda’s cinematically laid back aesthetic. The palette is treated as though its been burnt or left to age, with deep, rich colors such as rust, cognac, midnight blue and hunter green. Many of the wools come speckled, adding a variety of texture and richness to the garments. Shirting comes in solid varieties, ginghams, stripes, and other patterned combinations that when paired together create subtle yet interesting looks. Full length and cropped trench coats exude a sense of modernity whilst remaining true to Neruda’s romantic nostalgia. This is Campos’ ode to common things – bicycles, handwritten letters, and afternoons without plans. Damn!! The jacket’s are to die for. For real. I’m really impressed. I had never heard of the designer until now. Thx!